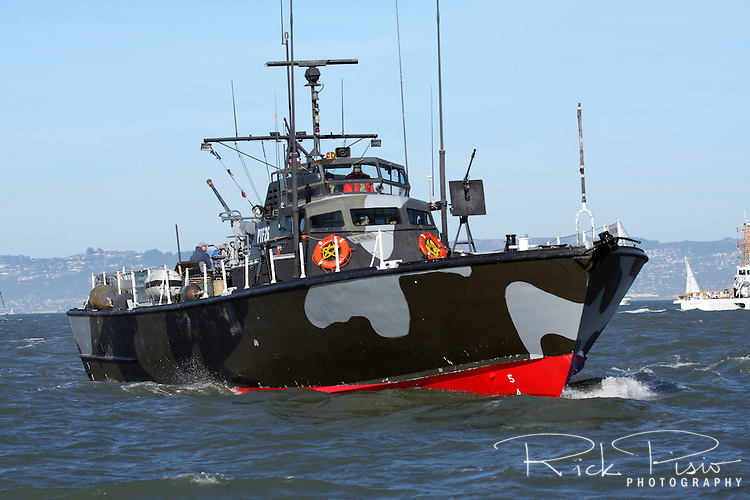 PTF-26 on San Francisco Bay during Fleet Week, 2010. PTFs were the Vietnam War version of the famous WW II PT Boats. They were heavily armed, near-coastal gunboats, used mostly by Special Forces. With a crew of 19 manning a 40mm Bofors cannon aft, two 20mm Oerlikon AA guns just forward of the house and a .50 caliber Browning machine gun/81mm mortar piggy-back mount forward, her design speed was 40 knots. PTF-26 is the last of only four Osprey-Class PTFs, the bigger, aluminum-hulled sister to the wooden Nasty-Class boats. PTF-26 is the final PTF and the last US PT Boat ever built. PTF-26 is operated by the Liberty Maritime Museum in Sacramento, California.